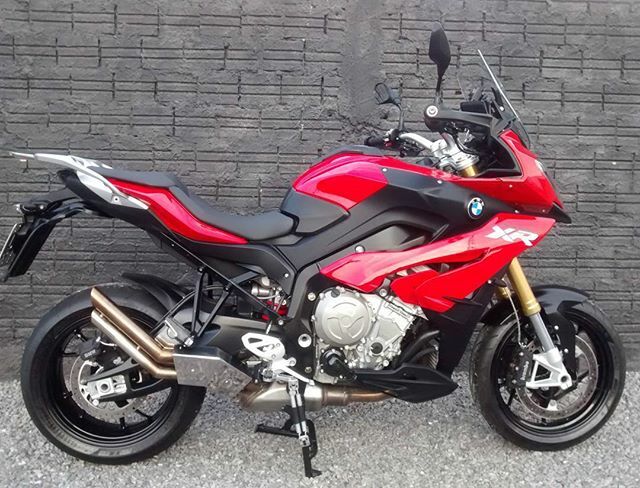 Black Akrapovic Slip-on on a Red S1000XR? I searched online for hours just to find this one photo of a red XR with a black Akrapovic exhaust. For my taste, I think it looks slightly better than the titanium version. Does anyone else have one on a red XR? If so, can you post a photo? 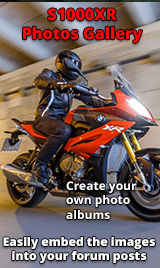 Re: Black Akrapovic Slip-on on a Red S1000XR? I hope I do not offend you cause that is not my intent but I find these Akra's so enormous! They are even bigger than the originals. I like those smaller ones like the early S1000RR. I now have the Bos exhaust. It is smaller and less 'present'. But I hope you enjoy the bike AND the exhaust! Have fun! Looks fine, but would preclude the fitting of panniers. That said - if you use the panniers only twice a year, an easy job to change the can back. I remove the can to secure the bike on my trailer - takes 2 mins. Looks fine, but would preclude the fitting of panniers. As the manual mentioned: Panniers should fit like with the normal exhaust!!! I saw an XR today with Akra fitted, it's not a looker for sure, not overly keen on th eorigional, but th eAkra looks like the original with some stickers on. Is it really worth it, how much are they ? Plexat, The reason why I like the all black Akrapovic vs the Titanium model that BMW dealers sell is because it doesn't stick out like a sore thumb as much as the Ti version does. On the red XR it kind of blends in even though it is quite large. I can imagine the black is more blended in than the titanium. Although I do think it is rather big! But then again everyone his one taste! You could always go with the Chopper look.